It’s been awhile but I’m going to try to start posting on here again from time to time. I will try to do some short posts on different things we are trying at home. No promises on consistency though! Yesterday was Superbowl Sunday. 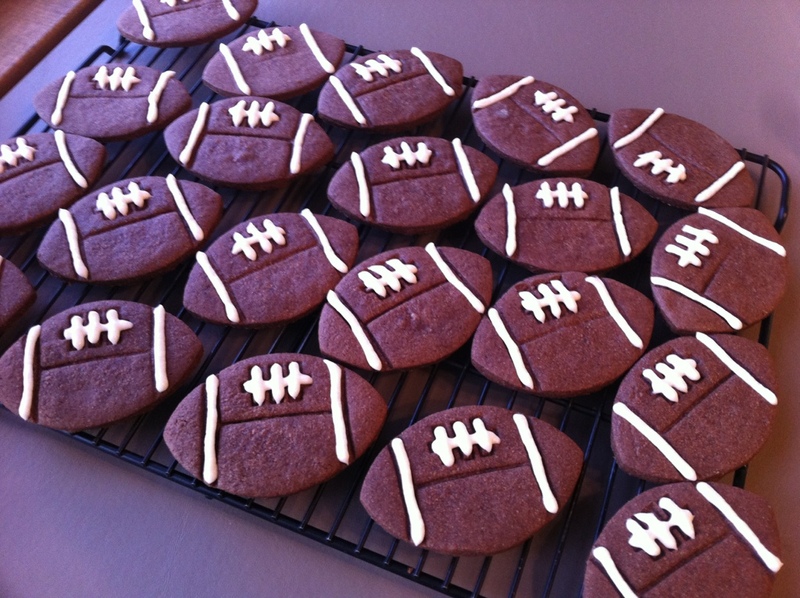 I was feeling festive so I made football cookies! I thought that Valentine’s Day would be the next holiday but last weekend I remembered I had a football cookie cutter. I was going to make regular sugar cookies and ice them brown but then I thought, why not chocolate sugar cookies? It would save me some work and I could try something new. Then I made a half batch of basic buttercream frosting and piped on the lines using a sandwich bag with the corner snipped off. I didn’t even use half of that so you could get away with a quarter batch of frosting. Just add a bit more milk than usual so it pipes easily. I got about 3 dozen cookies out of the recipe and I was very happy with how they turned out, both in taste and appearance. These would also be fun for a kid’s party!